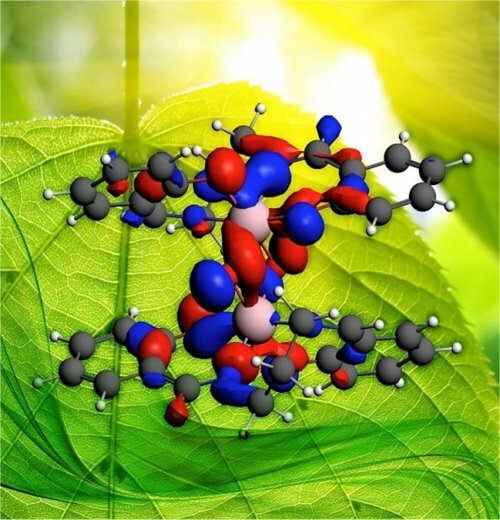 Results: An enigmatic protein system that uses sunlight and water to create fuel became a little less mysterious, thanks to scientists at Pacific Northwest National Laboratory, University of Michigan, and University of California—Davis. The photoactive protein known as the oxygen-evolving complex, or OEC, is found in plants and algae and is deeply involved in photosynthesis. Determining the geometric and electronic structures of a model for OEC was done using ultra-cold experimental and first-principle theoretical techniques. Why it matters: Through photosynthesis, plants and algae use intermittent sunlight to create readily available fuels. Scientists and energy experts want to design industrial plants to do the same thing. But before this process can be designed and controlled on the large scale, it must be understood on the small scale. Uncovering OEC's structure provides fundamental insights for modeling and simulating the molecule's behavior. With greater confidence in models, scientists can delve more deeply into the photosynthesis process, learning what is needed to mimic the process on the large scale. Methods: To determine the geometric structure and arrangement of electrons in OEC, the researchers brought together experimentation and theoretical calculations. They used bis(μ-oxido)dimanganese(IV) complex [Mn2O2(salpn)2] as a model for the manganese-based motifs in OEC. They employed a 55Mn solid-state NMR at cryogenic temperatures. Using this instrument allowed the team to study the molecules with multi-spin sites. Having multiple spin sites is typical of energy materials. The NMR equipment was made available through a user proposal process at EMSL. Based on the experimental results, the team applied first-principle density functional theory calculations to determine the structure and corresponding NMR parameters. The structure of the material involves a central pillar with manganese and oxygen atoms coordinated by large ligands representing the surrounding protein environment. What's next: This study is part of broader fundamental biomimetic energy research being done at Pacific Northwest National Laboratory, including studies being done at the Energy Frontier Research Center and Institute for Integrated Catalysis. Acknowledgments: The work was supported by EMSL's Intramural Research and Capability Development Program, Pacific Northwest National Laboratory, and the National Institutes of Health. This work was performed at EMSL, a Department of Energy national user facility located at PNNL. The research was done by Paul D. Ellis, Jesse A. Sears, Ping Yang, Michel Dupuis, and Andrew S. Lipton of Pacific Northwest National Laboratory; Thaddeus T. Boron III and Vincent L. Pecoraro of University of Michigan, and Troy A. Stich and R. David Britt of University of California—Davis. Reference: Ellis PD, JA Sears, P Yang, M Dupuis, TT Boron III, VL Pecoraro, TA Stich, RD Britt, and AS Lipton. 2010. "Solid-State 55Mn NMR Spectroscopy of Bis(μ-oxo)dimanganese(IV) [Mn2O2(salpn)2], A Model for the Oxygen Evolving Complex in Photosystem II." Journal of the American Chemical Society 132, 16727-16729. DOI: 10.1021/ja1054252.